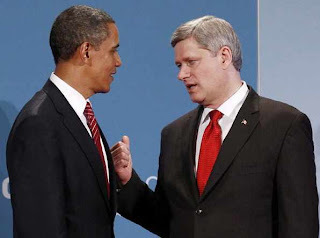 Some intrepid photographers were able to catch a couple of candid moments between the leader of the USA, President Obama and the leader of Canada Prime Minister Harper. The images were caught on two different occasions and I'm sure if either of them could 'take them back' they would. 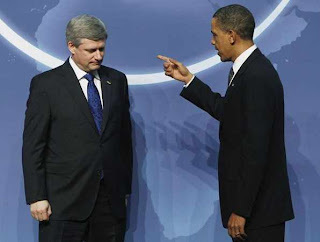 The first image looks as if President Obama is scolding our Prime Minister about some perceived wrong doing on the part of Mr. Harper, while the bottom photo looks as if our Prime Minister is going to give Obama a piece of his mind.